Before you even ask, no, this 3D-printed electric motorcycle is not production-ready. It is, as I have been informed, just a design demonstration. But it’s freaking sweet and I would very much like to play it in a game because that’s probably the closest that I’ll ever get to riding it. 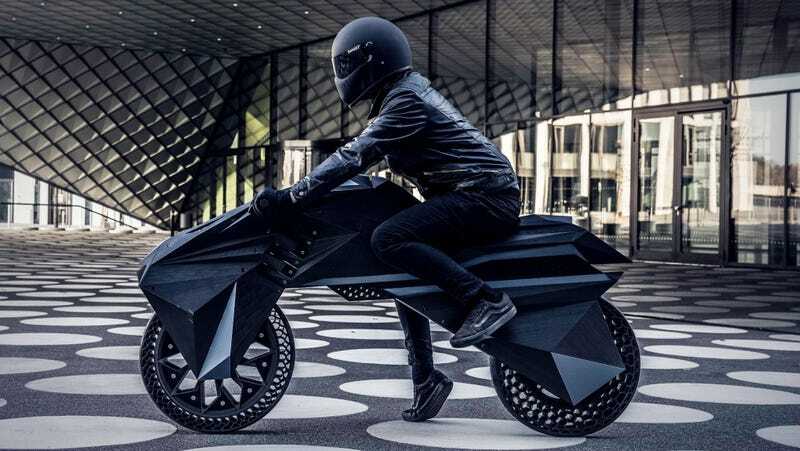 The bike was designed by NOWlab, an innovation consultancy for BigRep, a German 3D-printing company. It was printed in 15 parts, a company rep told me, which include the wheels, tires, frame, fork and seat. Electrical components were added later. There’s an electric motor that drives the rear wheel. The battery, control box and cables are in the bike’s body. The tires themselves are apparently airless, as their 3D-printed honeycomb design removes the need for air. The front tire is designed with an arch structure for a softer and smoother ride quality, while the rear tire is fortified for more load-bearing functionality. The bike is just over six feet long and weighs 132 pounds. It has flexible parametric bumpers that replace the suspension system as a shock absorber. There’s also a custom fitted seat, chest rest and forkless steering that has eight pivot points that increase joint strength. The bike reminds me a little bit of the light cycle in Tron: Legacy. Its proportions aren’t as extreme, but it has all these really cool rhomboidal shapes and a slim body. Plus, the single headlight is striking to look at, almost like it was folded from a piece of origami paper. Obviously, I have no idea what it’s like to ride, how it feels over bumps or how it handles. But I kind of want someone to stick it in something like Cyberpunk 2077 so I can use it and be badass.